In large bowl, mix cookie mix, softened butter and egg until soft dough forms. Press two-thirds of the dough in bottom of pan; bake 15 minutes. Remove from oven. Drizzle condensed milk over cookie base. Sprinkle with Snickers™ pieces and 1/2 cup of the M&M’s™ chocolate candies. Crumble chunks of remaining cookie dough over candy. 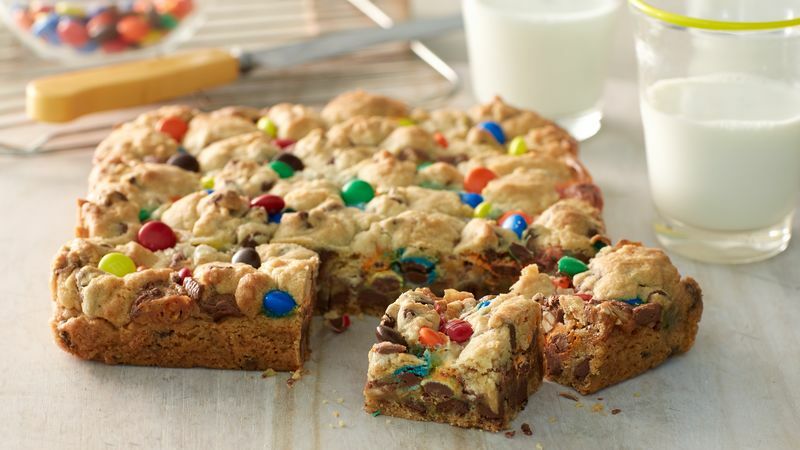 Sprinkle remaining 2 tablespoons M&M’s™ chocolate candies over top of crumbled dough. Bake 23 to 28 minutes or until top is golden brown. Cool completely, at least 3 hours. For bars, cut into 4 rows by 4 rows. Fall, Spring, Christmas or Canada Day -- take advantage of the array of seasonally coloured M&M’s™ chocolate candies. This gooey bar will be a show stealer every day, whatever the occasion.